Colombia’s Caribbean Coast & Lost City – The Great Canadian Travel Co.
Colombia has a certain kind of magic that you won’t find anywhere else in the Caribbean. On this trip, you’ll experience it first-hand via visits to rural villages, treks through Tayrona National Park’s picturesque trails and (of course), downtime on the beach. Later, head to deep into the jungle to Teyuna – the fabled Ciudad Perdida (Lost City) older than Machu Picchu – a place crowded with history and free of crowds. Colombia is mysterious. Come figure out the riddle. Prices are shown in CA$, per person, based on two people sharing a twin room or one person in a single room. Single rates may vary slightly from the price shown, depending on the availability of single rooms on each tour. We will quote an exact price once you have chosen a tour date. Arrive at any time! Explore the city on your own before joining the group. Make sure you’re back in time for the welcome meeting! Today you will be enjoying a guided city tour to learn more about the history of this lively city. Visit the clock tower, Plaza Bolivar, and the Castillo de San Felipe de Barajas. Take in the views of the city from the hilltop Convento De La Popa and enjoy a walking tour from San Pedro Claver Church to Santo Domingo Church. Enjoy some free time in the afternoon to take in the Caribbean vibe of the city and beach. Your guide will have plenty of suggestions for you if you are looking for activities to partake in. This morning you will be transferred to the small town of Minca. As you arrive, take a deep breath of the fresh mountain are and enjoy some free time to explore this beautiful area. Today you will explore the hills surrounding Minca and hike to a beautiful waterfall and Pozo Azul. 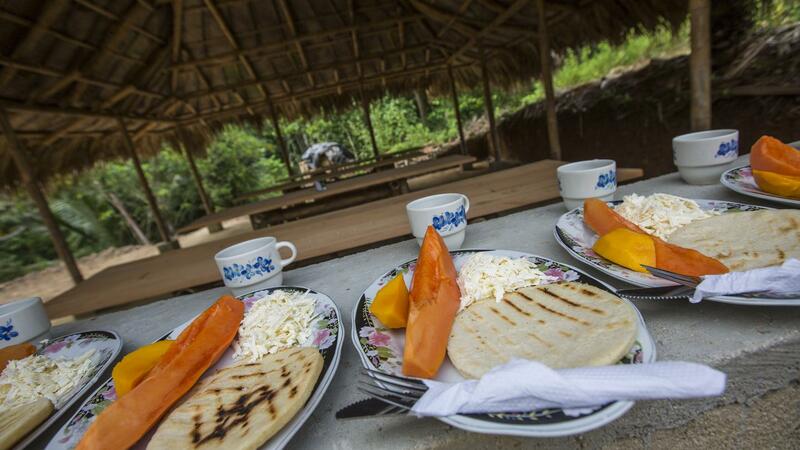 Take a tour of a coffee farm, learn about chocolate preparation, and taste authentic Colombian food at lunch. After lunch you will continue on to Taganga, a perfect base for exploring nearby Tayrona National Park, in a 4×4 on a jungle road. Hold on tight, it can be a bumpy ride. Spend today exploring Taganga. Opt for more active activities such as snorkelling or hiking. Hit up one of the beaches and just relax in a hammock. 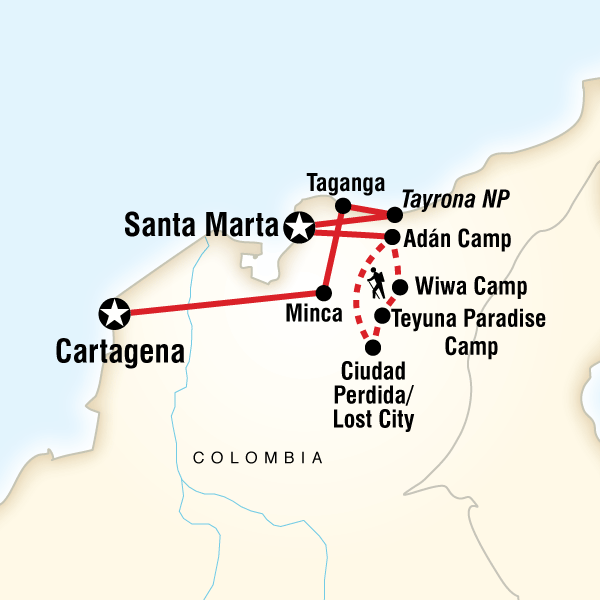 Today you will be heading into Tayrona National Park for a moderate hike with a local guide. This is a perfect opportunity to experience nature and learn a little more about the rich, natural diversity of northern Colombia. You will be staying in a lodge close to the park. Today you will return to Santa Marta for an optional evening out on the town. Relax on the beautiful Caribbean coast in Santa Marta or go further to explore. Use the day to soak up some son or make any last minute purchases before starting the next big leg of your adventure. If you are looking for suggestions on activities to do today, ask your guide. They will have a plethora of ideas for you. 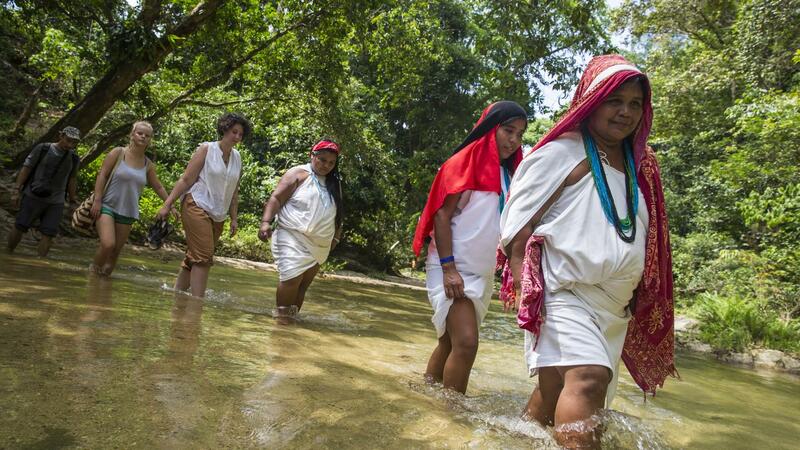 Today you will be transferred to Machete Pelao, the beginning of your trek to the Lost City of Teyuna. You will trek through farmland, steamy jungle, rural Kogi communities and get a glimpse of the local way of life in the remote river valleys of the Sierra Nevada Mountains. 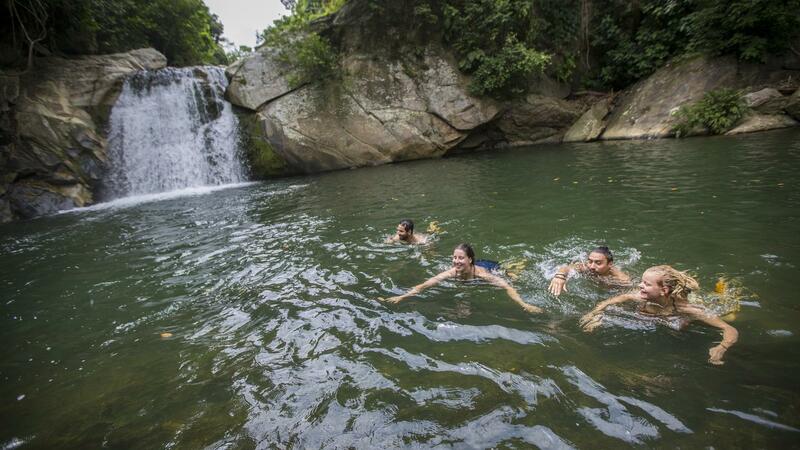 As you leave Machete Pelao, you will start trekking through the jungle along the Buritaca River. You will pass through farmland and small communities en route to the lunch stop. After lunch, continuing on beside the river and through the farmlands of coffee or cattle. You’ll be climbing uphill from the riverbed and through humid jungle. As you pass through some of the Kogi villages, take a look at the unique, circular huts they live in. Awaiting you at the end of the first trekking day, is a swim in the cool river, a hammock nap and dinner. 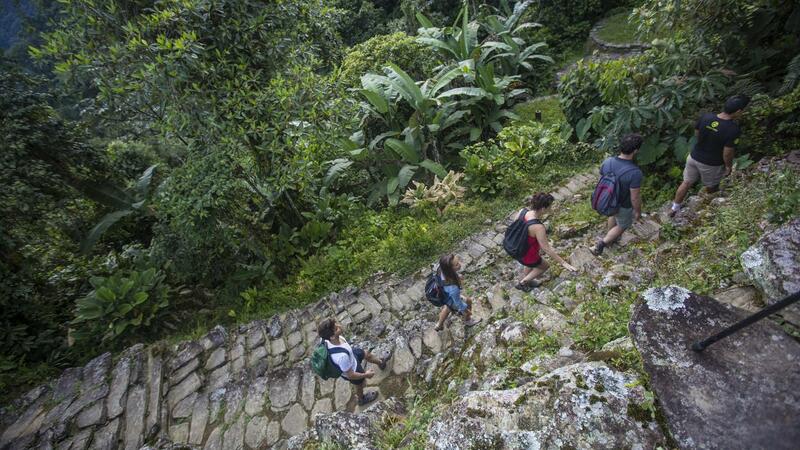 Continuing your trek along the route to Ciudad Perdida, you will be faced with many steep inclines so make sure you rest and take in the beautiful views. You will arrive at camp in the afternoon with enough time to relax by the river and cool off with a swim. Wake up early to start climbing the 1,200 steps up to the Lost City. The view of the surrounding Sierra Nevada Mountains makes it well worth the hike. Explore the Lost City and learn what is known of its origins from the guide, before making the descent back to Wiwa Camp for the night. 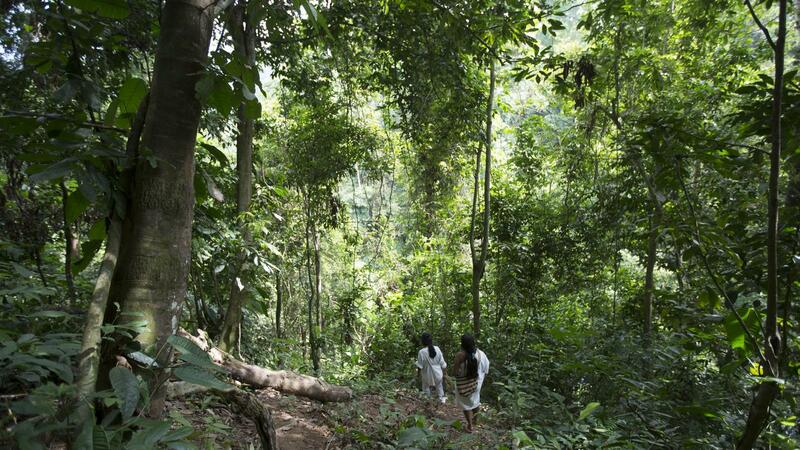 Today you will follow the path through the deep jungle, winding through banana trees, cacao plants and small Kogi communities on the way to Ricardito Camp. The nickname for this camp is vista hermosa or beautiful views so sit back and soak it all in. Along the way, you will stop at Adán Camp for a dip in the cool river or a fresh fruit juice. 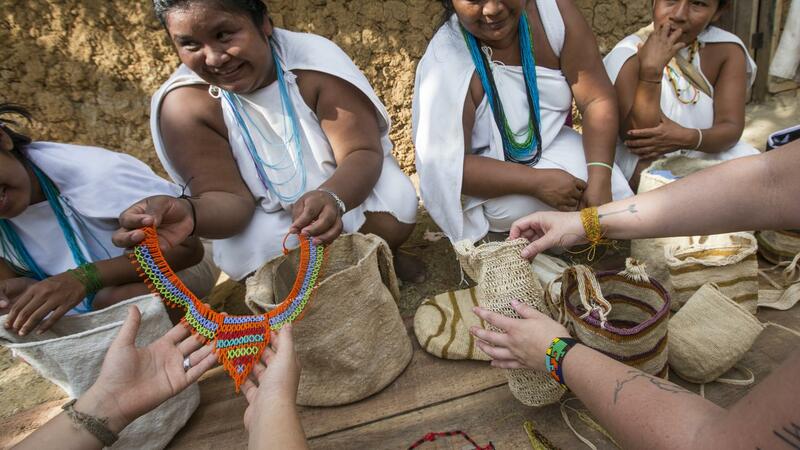 Today you will head across grassy hills and gentle streams to read the Gotsezhi Wiwa indigenous community where you will enjoy a community lunch prepared by women from the community. 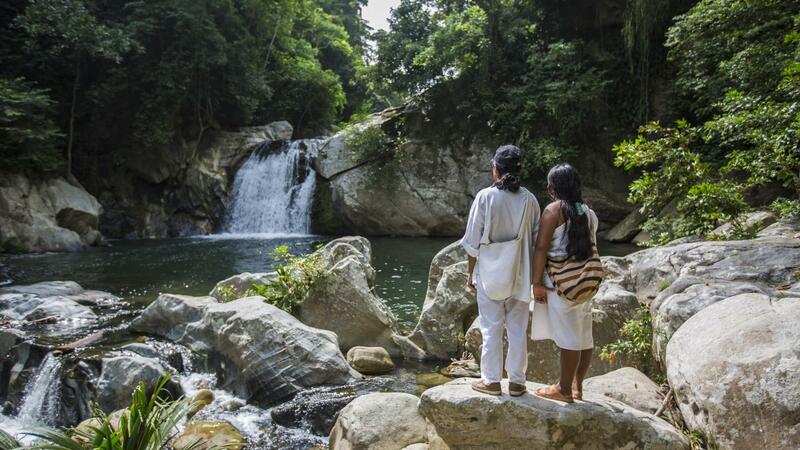 Learn about Wiwa customs on a village visit then lounge in a hammock by the river or opt to explore nearby waterfalls. In the afternoon, you will return to Santa Marta for a well deserved night in a hotel. Today you can depart at any time. 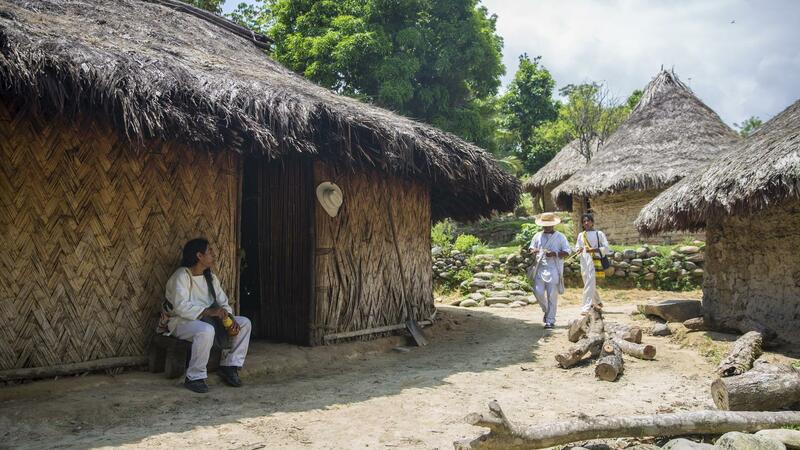 If you have some time left before your flight home, feel free to take in the free Gold Museum Santa Marta where you can explore the colonial mansion that houses indigenous artifacts from the Tayrona area. You can also opt to visit Simon Bolivar’s final resting place, la Quinta San Pedro Alejandrino. This is the estate where the famous libertador spent his final days. The former rum plantation now includes a restored house, museum, library, and extensive gardens perfect for exploring.